Scientists say if bees were better homebodies it might be better for them and for us. During a few weeks in February, some 1.5 million honeybee hives will be drawn from all over North America for a pilgrimage to California, in which they will descend on the state&apos;s almond groves at a critical moment in the trees&apos; flowering cycle. More than three quarters of North America&apos;s honeybees will arrive in the Central Valley just in time to pollinate the $2.3 billion almond crop. And when their work there is done the beekeepers will fan out with their bees to provide the same service for nearly every farm field in North America. Gordon Wardell, senior biologist and bee expert for Paramount Farming Company, the nation&apos;s largest almond producer, says hives are already pulling in by the truckload for what has been called "the great promiscuity" by the beekeepers who attend. Scientists and beekeepers alike wonder if, in this vast melting pot of insects, dangerous pathogens could be exchanged as bees from different hives visit the same flowers. The question matters hugely as so-called "colony collapse disorder," or CCD, over the past four years has killed up to a third of all honeybees in the United States, accelerating an existing decline in native pollinators in North America and Europe. From his vantage, Wardell says, beekeepers arriving for the festivities this year "are all saying the same thing about their hives — &apos;looking good&apos; — so far.&apos;"
While many hypotheses have been advanced for the decline in pollinators, researchers have not yet arrived at a definitive cause of CCD. There is evidence to suggest one or more biological pathogens may be involved, and recent findings from Pennsylvania State University suggest that pollen itself may serve as a vector in spreading some of the viruses associated with CCD. Results of three years of research published earlier this month find that North America&apos;s native bumblebees have also been experiencing steep declines, and it may be that pathogens are jumping from domesticated honeybees to pollinators in the wild. The Pennsylvania pollen researchers, led by entomologist Rajwinder Singh, found evidence that viruses attacking honeybees had spread beyond that species to their wild cousins, likely through pollen. Meanwhile, since pollen is sometimes purchased to feed stocks of domesticated bees, concerns about contaminated pollen adds yet another vector to the mix. With at least a third of our food supply, from fruits to nuts, and even beef on the hoof that fattens on alfalfa, depending on bees for pollination, the disappearance of bees, domesticated and wild, is cause for major concern. "It&apos;s hard to know if there is interspecies transfer of viruses, but there is a potential," says Neal Williams, native pollinator specialist in the department of entomology at the University of California, Davis. While "it&apos;s not good to lose any species," Williams says, losing the very productive bumblebees would be especially troubling. Thanks in part to their larger size, fuzzy pollen-grabbing coats and greater range, "bee for bee, bumblebees are better pollinators than honeybees." Although the cause of the bumblebee&apos;s disappearance has not been established, William&apos;s says, "We&apos;ve seen a trend where some species seem to drop out as we lose natural habitat." Eric Mader, assistant pollinator program director at the Xerces Society, a nonprofit organization dedicated to conservation of invertebrates, places the accidental importation of exotic pests and diseases high on the list of suspects responsible for killing off pollinators. In particular, he sees that as a likely cause of honeybee decline, which coincidentally began after bees from outside North America were first imported in 2005 (after an 83-year hiatus). "We&apos;re seeing the unintended consequences of globalization. "We&apos;re likely seeing several bee species go extinct," he adds. Until recently growers could import bee hives from Australia to supplement services available to bee keepers in the United States, but the USDA placed a permanent ban on that practice in December 2010. The goal is to prevent the introduction of bee pathogens that had been detected among invasive feral bees from Asia that had been accidentally let loose Down Under. While scientists are not ready to give up on bumblebees or honeybees, researchers like Mader and others have suggested that now might be a good time to work toward assuring the health of North America&apos;s remaining native bees. Williams says he is confident that if their habitat can be restored and protected, some of the 4,000 species of bees native to North America could play a more important role in supplying pollination services to agriculture. But they need to be healthy. Mader and Williams agree that, from the immune system to the gene pool, habitat is the path to that health. Bees need a varied diet, with ample food sources and nesting sites nearby, and a fluid gene pool, Williams says. For farmers who need wild bees for pollination, that could mean flowers and weeds smack in the middle of their fields. And that presents a dilemma. "The challenge is the fear of losing cropland, that affects the economic bottom line," Williams says. But it may not be an either/or situation, suggests a 2005 study of wild pollinators in Canada&apos;s canola fields. Mark L. Winston, co-author with Lora Morandin of that study, said the detailed research demonstrated that growers who left roughly 30 percent of their fields wild, allowing weeds and native plants to grow untended near or interspersed among their crops attracted more native pollinators, achieved considerably higher yields in canola seed, and as a result generated higher incomes than those who planted 100 percent of their fields with canola. Williams declined to put a figure on what percentage of habitat would need to be untilled to foster a profitable relationship between native bees and farmers in the United States, saying it would vary depending on the crop involved, the intensity of agriculture and other local conditions. Location, too, matters. Because farmers still spray for pests, he says, "You wouldn&apos;t want to put your habitat in the middle of a field — you don&apos;t want to attract the bees to an area and then spray them." Still, he said, given the uncertainties in the managed population, "almost anything we can do to promote habitat will be beneficial." The 2008 U.S. Farm Bill provides some support for restoring this natural pollinator habitat. "Right now we have a unique opportunity to try and work through this," Williams said. "We have programs that are funded through USDA for cost share, through a direct payment to farmers, to establish and maintain those habitats." Williams says getting people to change "is as big a challenge as anything." "But farmers can surprise you. You&apos;ll always have some early adopters — people who would do it even if you didn&apos;t pay them, but some of the farmers who have been really willing to participate in this, have been really conventional growers who grow large acreages of high-value crops for seed production and things like that." He is now researching whether there are threshold levels of habitat that different species require within certain landscapes and how that habitat can be configured in agricultural areas to be of greatest benefit to the bees. 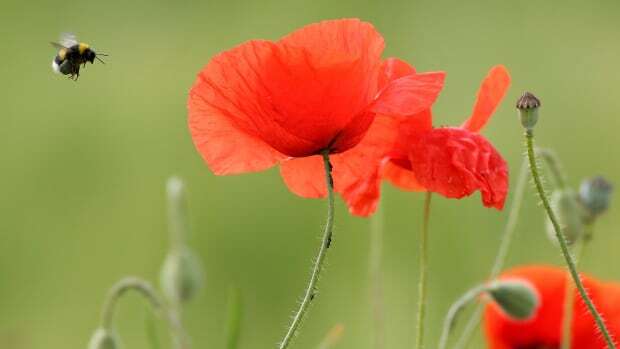 "One of the challenges is working around arable farmland and finding places we can reserve that would provide food and nesting sites for different kinds of bees. "And that is very likely to be a benefit to managed honeybees as well." Mader says, "Areas of robust habitat can serve as a corridor connecting distinct populations including populations that may have some natural resistance to disease, enabling them to get out and share those resistant genes with other members of their species." Furthermore, "bees have a very interesting reproductive system that makes them particularly prone to inbreeding depression. In the case of bumblebees, isolated populations can quickly become locally extinct without a regular transfer of new genes between different groups of bees." Wardell says many almond growers, too, are looking for ways to work more cooperatively with native bees. "It&apos;s always a challenge to find enough bees to pollinate Paramount Farms&apos; 45,000 acres of almonds." 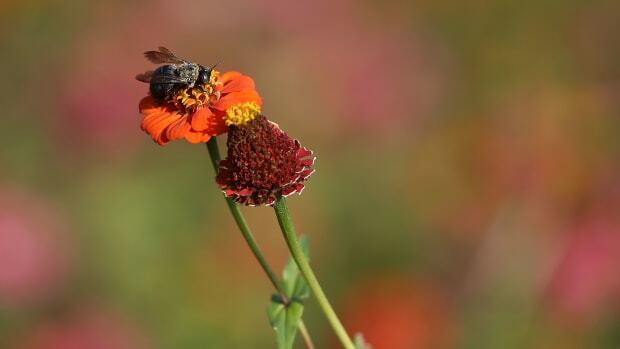 Although he said the company has put some effort into installing stretches of wild plantings along the farms&apos; roadsides and borders, the semiarid region has never been home to a large population of native bees. Nonetheless, Wardell says he&apos;s found a promising understudy to the honeybee. Although it has to be plied with artificial heating to emerge from its nest in time for the almond bloom, the blue orchard bee, Osmia lignaria, from Utah, is an efficient pollinator with many characteristics an almond grower would appreciate. After making a stop by Paramount&apos;s Osmia breeding enclosures, Wardell noted his satisfaction with the progress of the emerging young insects. He conceded it will take a while to work out the best techniques for the propagation, release and recovery of this wild species. He added hopefully that they seem to get along well with the honeybees, and that with their divergent lifestyles and behaviors he might even like to see the two species work the groves together. "We may even get better pollination." As bee populations decline, so do their pollination services. Researchers have developed a new acoustic monitoring method to measure bees' productivity.